We finally got a stretch of decent fishing and decent weather. It was nice to fly around the gulf at 40 mph for a change and I took full advantage of it and toured most of the northern gulf for a little change of scenery. On thursday I had Hendrick Engel and his friend Justin in and we hit the lump first which was unproductive. We did pick up a blackfin on a swimbait. 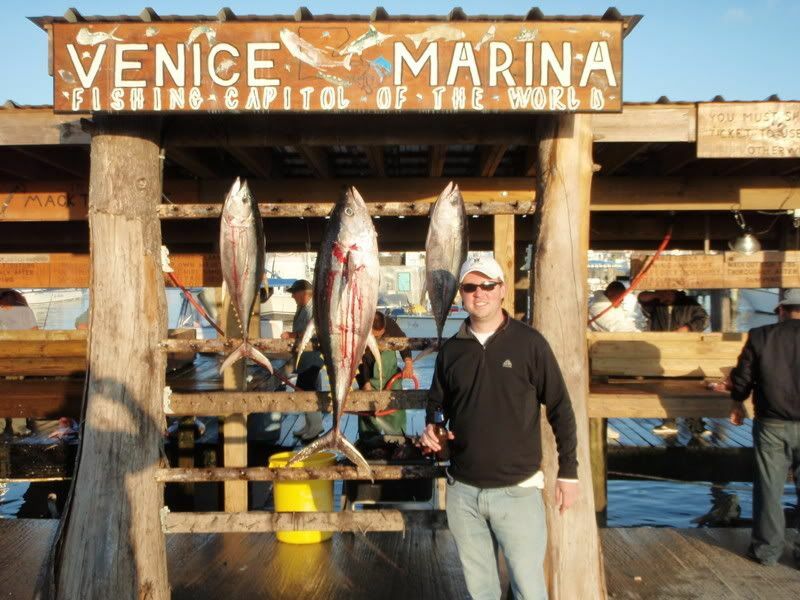 before we left and went over to the 93s and jigged us up a limit of amberjack. It took 2 drops of a jig to get it. 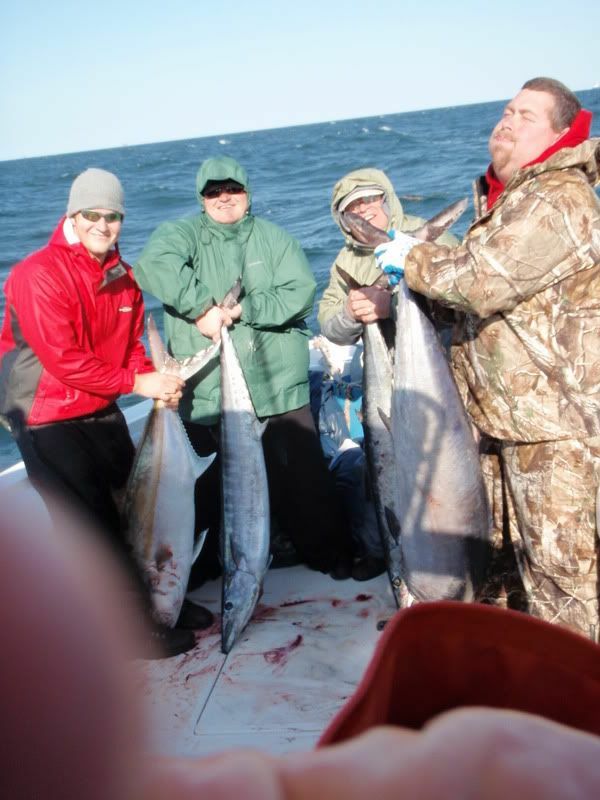 On friday I had Charlie gray and friends and we decided to head out to south timbalier and wahoo fish. It was dead as a doornail over there and I trolled about 10 rigs. I saw this floater off in the distance so I went over there and started jigging. Keep in mind this was the first rig I had stopped at and not trolled all day. As were letting the jigs out one of the guys points at the barracuda swimming by the boat. I glanced over and realized that we had a hooter swimming down the side of the boat. So out go the lures and on the first pass we pick up a 40 pound wahoo on the hot pink braid marauder. We make about 5 more passes and catch one barracuda so I guess there was only one wahoo at the rig. 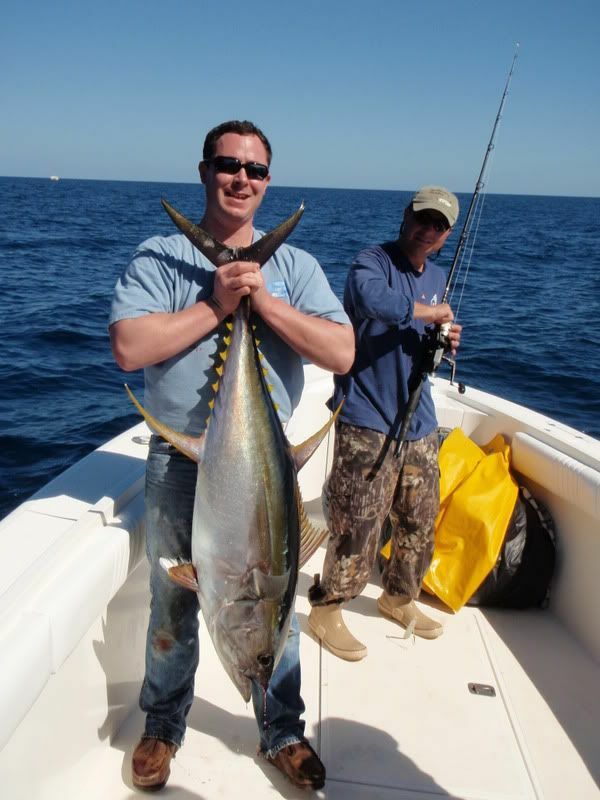 We get down to chunking and Charlie hooks up on a 30 pound yellowfin to put in the box. 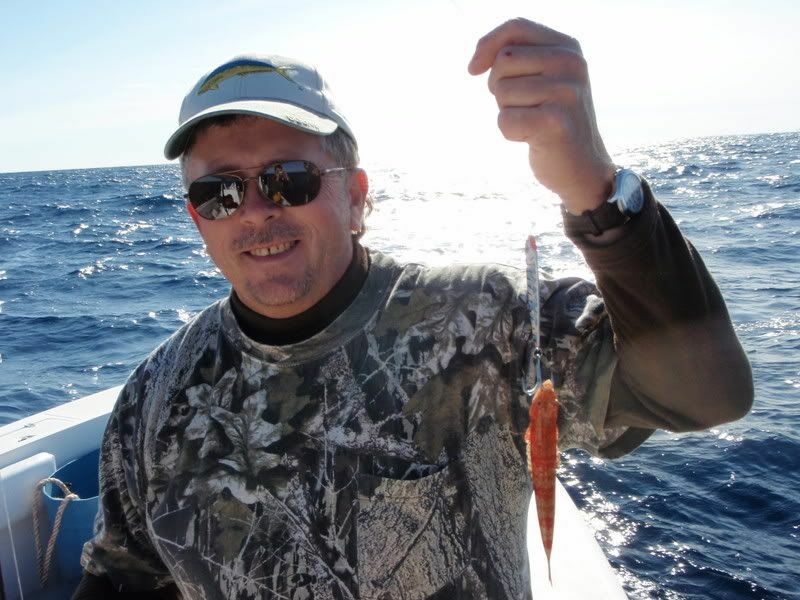 We continued that drift and I hooked a yellowfin on a williamson jig. While Larry is fighing that fish we double up the two chunk lines so we now had three yf on. Land all three and the bite dies off so we head to the house with 4 yf and a wahoo. The bad thing was when I looked at the gps to head to the dock I was 93 miles offshore. Luckily it was nice and calm so we cruised in about 38 mph. On saturday I had John Skinner in from Lagrange, Ga who wanted some yf. We headed out to the celtic sea and proceeded to get jiggy with it to make some chum. We were getting blacks on every drop of the jig when John hooked something a little better and we added a 25 pound yf to the box. That was the only yf there so we headed south and hit a dry rig and then went to the west a little and found a pod of fish. First two drifts yielded two yf one at 30 pounds and one at 70 pounds which made their day. 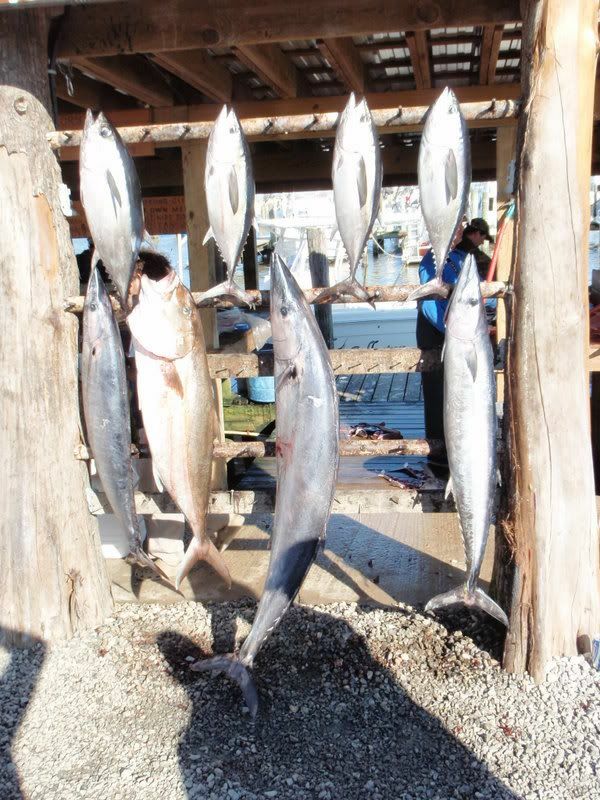 We hit some rigs on teh way in and tried to jig some ajs which didnt work so we headed to the dock with our 3 yfs. On sunday I had chris king and we ran out south pass for some wahoo. The spread was two pink marauders and a pink stretch 30. On the 4th rig we made a pass by we tripled up. First fish that made it to the boat was a 40 pound hooter on a braid. Next one in was an 80 pound wahoo on a strech. The third fish took another 15 minutes and I knew it was a good one and then up pops a 50 pound aj. A little dissapointment but a quality fish. We made another pass and another wahoo in the boat before we headed to the lump to catch a handful of blackfin and call it a day. 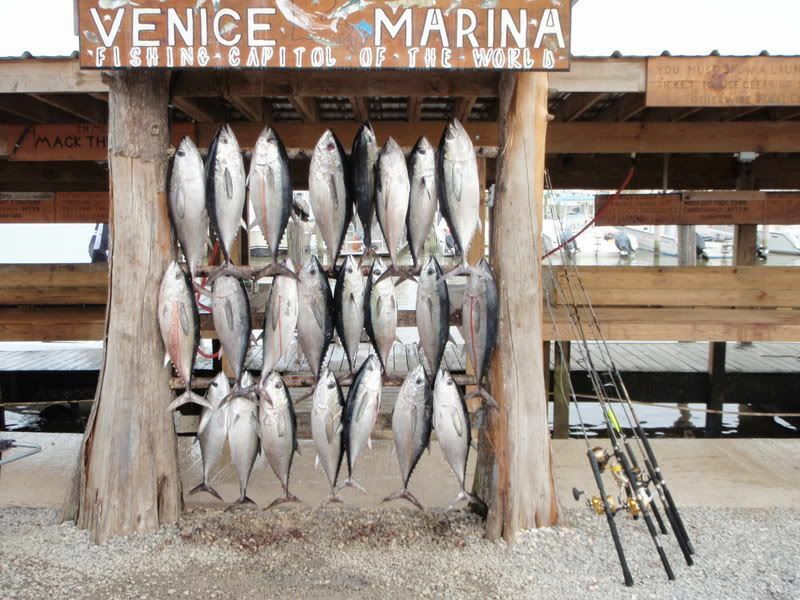 On Monday the blackfin bite was off the hook. Rob and his friends were killing the blackfin on poppers in the chum slick while a couple other guys were picking away at them on chunks. The most productive popped seemed to be the daiwa saltiga popper. We even chunked up a couple of blackies on a spinning rod and a penn torque. We ended the day with 23 blackies. I headed out yesterday and tried to repeat the success and it just wasnt goign to be. I knew we had to get out there and back in early because of the front rolling in. 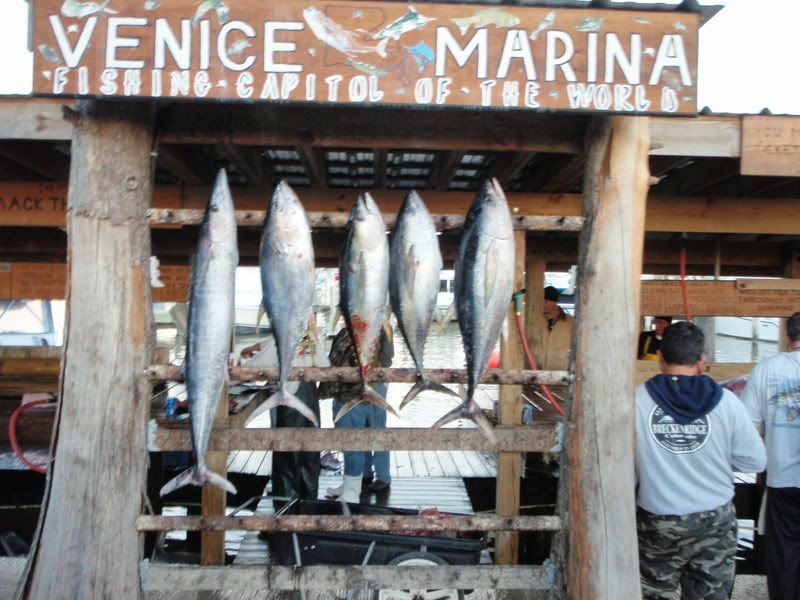 We caught 2 blackfin on the lump and went and tried a little wahoo fishing with no success. We beat the front to the dock by about an hour which was lucky because the winds were gusting to 40 at southwest pass.